There is a sad story, with a happy ending on the Island this spring It involves the fabulous candle store on the Island—CandlEssence— their Location, And Treachery and UN-Balboa Island Type Behavior. Well, there is a God, and I am not him, because I had nothing to do with the end of this story. Kathy and Stephanie offered them the back room at Martha’s Bookstore—308-1/2 Marine Avenue. Their new place is brighter and lighter and more wonderful than ever—there always is an upside. And as soon as people discover Neil’s new location he will be busier than ever. CandlEssence candles are the best candles—they smell the best, they burn the longest and they have the magic ingredient—LOVE!!! One footnote to this story—there is now another candle store where CandlEssence was located—and pretending to be CandlEssence—but customers know better. A good friend of mine entered the old store last week, noticed the difference, and asked where Neil and Stacy had gone—the old “landlord” would not tell them—now that is what I call “Un-Balboa Island Type” behavior. (And for the records—the “landlord was NOT either Hidden Treasures or Shirley’s Heart—so don’t place blame on those good folks!!! Now a very nice little story—“As I was taking my daily walk on Balboa Island and visiting the fire station restroom, I couldn’t help but notice Kathy Parks sitting in the middle of the gorgeous arrangements of plants and the photo op was just too good to pass up . . .” writes Mary Newton, “I have noticed her working so hard throughout the years and wanted to let her know in some little way how much she is appreciated by all.” That is so true—Kathy has created beautiful flowers for the bridge, the post office and the fire station for many years. Thank you Kathy—and thank you Mary for this fabulous picture. “Amelia” shared her secret for good cooking with me years ago, saying, “You have to cook with love!” Whatever she did, Amelia’s has been successful since she opened her wonderful restaurant in 1961. A top dinner house, local’s favorite and destination point for many from Los Angeles—Hollywood regulars included Jane Russell, Burt Lancaster and John Wayne. However it was Clair Trevor and Milton Bren who knew Amelia’s family heritage and persuaded her to put Italian food on the Menu—Amelia’s then became the recipient of many awards! 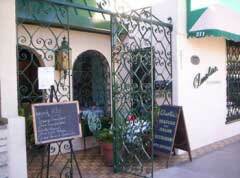 Amelia’s journey to Balboa Island began with her birth in Italy. Living in Sorrento, she fell in love with Greg Seton, A US Army Staff Sergeant. In 1945 they married in her home town of Capri and quickly moved to the Silverlake are of Los Angeles. While Greg and his father managed their real estate company, Amelia was busy in church and raising their two children, Hetty and Randy. On one of their mini-vacations to Balboa Island, Greg learned Norton’s Restaurant on Marine Avenue was for sale and much to his chagrin Amelia was soon on a mission to buy the restaurant and live on Balboa Island. 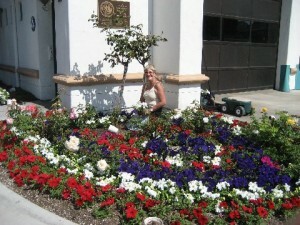 Amelia’s she dedicated her time to many philanthropic associations while enjoying Balboa Island’s natural beauty. When I visited Amelia’s home I realized that it was an extension of the restaurant—except for her extensive collection of family pictures and her interesting collection of “Pigs”. The same yellow and green exterior décor is on both places, and both interiors blend a cultured, tasteful special atmosphere with a truly family feel. And best of all—her spirit and love linger in both places and always will!!! Would you like to be saluted as a Balboa Island ICON—please call Doris Lee @949.280.0507 or e-mail dorislee@coldwell banker.com. I just wanted to say that I enjoy getting the Island Breeze each month. I am a good friend of Brad Houston. Tom and Cindy’s (from Ruby) son, who has recently moved off the Island. I first met Brad in 1985 when he was working at Hershey’s Market. I have since enjoyed many summers and some winters on Balboa Island and have loved every minute of it. I love the Island the have been back 10 times I think since 1985. I always surprise the Houston’s when I come back. I am in Australia so Balboa Island is a long way away from me now and that hurts. I love the Island, the people, the Americana. Winter is upon us here now and I can’t help but dream these cold days away thinking about crossing over from Agate to the Peninsula and hearing that great old horn on the ferry. . . Anyway, I just wanted to say hi to you and that I enjoy reading the newsletter and hopefully I will be back soon to my beloved Balboa Island. Summer is here on Agate Avenue. We have a lot of changes!! Mike’s 30 year friend and awesome computer guru—Tom Stanton—has moved his office back to the Stone Building, 121 Agate Avenue on Balboa Island. Right across the street from me—which is great for me—and probably annoying for him. I have access to him whenever one of my four computer’s decides to rebel—which is often. If you have a computer problem be sure to call him at 949.675.6373. He will solve it in an instant—just like he does for me!! Andree at Berries and Blooms on the South Bayfront Boardwalk next to the Balboa Island Ferry tells me the corn and the heirloom tomatoes are coming in this week—yum!! I love them both and have been bugging her for corn since I got a brief taste over Memorial Day weekend when she ran out and I had to replenish with more expensive, less desirable ears!! I am a Mid-west girl, so I know great corn!! I have been enjoying her asparagus and strawberries all spring and am now relishing the melons and Mike’s favorite the Ghirardelli Chocolate dipped strawberries!! Andree has the best quality for the best price—and I get the bonus of a nice walk to the fruit stand instead of using gas to go the store!!! Down the boardwalk, stop in at JD’s Big Game Fishing and get everything you need for that summer fishing trip. Bait, tackle, rods, reels, books, clothing and advise from J.D. himself. Don’t think his knowledge is limited to local lore, his website http://www.JDsBigGameFishing.com has a catalog with over 10,000 items as well as information for the Worldwide Angler. JDs is located at 406 S. Bayfront, 949.723.0883. Also by the Ferry on South Bayfront is Tahiti Nui—Tahitian Black Pearls and other fabulous jewelry. Don’t be fooled by the protective film on the window—owner Voytek is always in there creating wonderful pieces—some are redesigns of old jewelry brought in by his customers. He always has a big smile and a nice word for me when I stop in to say hello and look at what is the latest and greatest in his store. Tahiti Nui is open Monday through Saturday (closed Sundays)10 am-6 pm. 504 S. Bayfront, 949.675.7904. Another big change—Island Spa on the Bay is coming to 504 South Bayfront—above the Island Market and next to the Balboa Island Museum and Historical Society. Christie Collier at Island Chiropractic’s therapists are so popular that they were rapidly pushing Christie out of her own therapy rooms. Christie needed more space. 504 S. Bayfront was the perfect answer. A beautiful view, a relaxing venue. Facials and saunas will be offered in addition to the wonderful massages that Island Chiropractic has become so famous for. Finally, Island Style has a lot of new things this summer—Balboa Island hats, Beach Towels and T-Shirts to go with the humerous T-shirts created in Texas by my niece, Myria, that say, among other copyrighted things, “The Older I get, the Less Tolerant I Get Of People That Aren’t Me”. And business is booming in the College, MLB, and NFL Flags, Doormats and Rugs that are our main staple. Great gifts for the new graduates. Wind chimes and beautiful gongs from Woodstock Chimes. Island Style is located at 118 Agate Avenue—Inside Island Flooring. Many Balboa Island residents do their banking at Union Bank of California on Bayside next to Pavilions. For those of you who are long time customers, like myself, we have seen a lot of people come and go over the years. Few are remembered as fondly as Jan Wylie, the little grey-haired teller who was a fixture a our branch until about 7 years ago when she moved to Missouri. Jan was always there with a smile. Mike and I got to know her well because she was a racing fan—her dad had been an old-time open wheel racer and was inducted into the Open Wheel Hall of Fame. Jan, her husband Dean, Mike and I went to several auto races—at Fontana and Perris. What fun times those were. We really missed her when Jan left Union Bank. Less than 6 months ago Jan was diagnosed with cancer and on May 27 she left us all for good. She will certainly be missed—Dean and Jan would have been married 50 years in July—and she leaves behind a whole bunch of us who loved her. New from Mohawk Industries—the people who brought you Ralph Lauren, Karastan, Custom Weave, Aladdin and all the other great carpet products, comes a new product—SmartStrand. SmartStrand also has excellent resilience and recovery attributes. In plain English this means SmartStrand won’t mat down like other polyesters and olefins. So you get the best of both worlds—this carpet will not only resist staining and fading, but crushing and traffic patterns. SmartStrand is Soft and Comfortable unlike older polyesters. SmartStrand is Earth Friendly—a joint venture between DuPont and Tate & Lyle PLC has been formed to produce PDO the key building block for DuPont Sonora polymer, using a fermentation and purification process based on corn sugar. This bio-based method uses less energy, reduces emissions and employs renewable resources instead of petro-chemical processes. SmartStrand has Engineered Stain Protection that won’t wear off. COME TO ISLAND FLOORING FOR A SMARTSTRAND DEMONSTRATION!! WE WOULD LOVE TO SEE YOU!! !